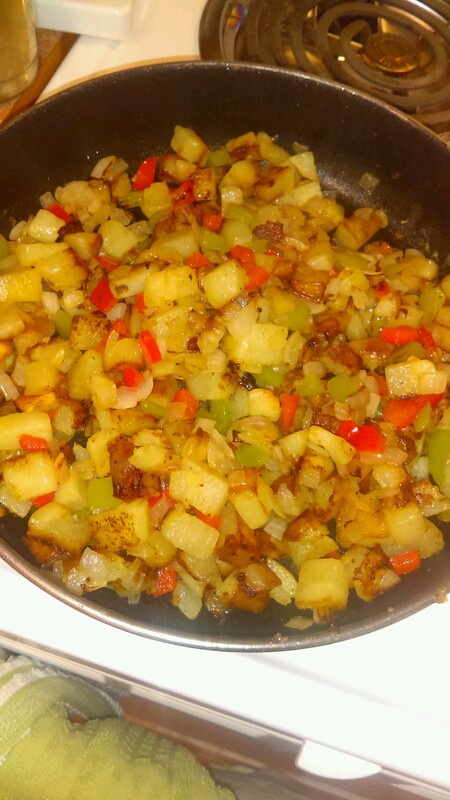 This is the breakfast potatoes recipe that I hinted at a week ago. I’ll probably eventually work my way up to adding bacon to the recipe, but for now, I’m using vegetable oil. The “add enough just to cover the bottom” took some work, as I wasn’t sure how much was too much. Or, I thought I did, but still ended up with too much, in my first two attempts. Now I know it is like basically half way up the Crisco cap. I definitely have been making them the Potatoes O’Brien way, with both green and red peppers. The very first time, I did add the onions to the potatoes at the initial phase but I’ve learn to not do that, as the onions get really burnt. I also have experimented with not cooling the potatoes for ten minutes, as I start hearing the pop of the oil around the four minute mark. Maybe that’s a sign that there is still too much oil? I just had that thought. So I usually, at the five minute mark, flip the potatoes, let them cook covered for an additional five minutes. Then I add my peppers and onions, turn in sections of every two minutes for a total of ten minutes. I think I have it done in five minutes, so next time, I’m going to try to stop cooking at five minutes and see how it looks as the potatoes seem done around then. Five or six minutes. The peppers really do make it look appetizing, and I’ve becoming more interested in adding color to my meals. I’m probably being influenced by all of those cooking shows that we’re watching. Taking my cooking game to the next level. Or, at least, trying to. We’re on the final episode of Daredevil, Season Two, that was the other television series we made progress on. I love that Netflix is doing a countdown to the Defenders. If only we were not two entire series behind, we could be getting hyped for that new series.